Kratie (Kampi village) with the small vegetated islands is home to the recently described Mekong Wagtail. An added attraction while searching for these birds is the small population of the critically endangered Irrawaddy Dolphin, which are resident in small numbers here, and we can hope to be entertained by several of these wonderful creatures. Other bird species could include the declining Grey-throated Sand Martin, Small Pratincole and Pied Kingfisher. 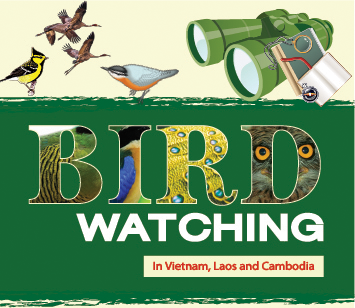 The grasslands in the Kompong Thom area is Bengal Florican reserve, it also holds many species of wintering passerines including Manchurian Reed Warbler, which winters in the long grasses in small numbers around Kompong Thom. While searching for this species, we hope to come across a number of other winter visitors; Black-browed and Oriental Reed Warblers, Bluethroat, Yellow-breasted Bunting, Pallasís Grasshopper, Dusky and Lanceolated Warbler are all present. Large numbers of raptors also winter here, including Greater Spotted Eagle. The entire 10,000 hectares of the protected area, ATT is good site for a day-trip from Siem Reap where we can see many waterbirds including Cotton Pigmy-goose, Lesser Whistling-duck, White-browed Crake, Bronze-winged and Pheasant-tailed Jacana and especially Sarus Crane as well as a chance for Black-necked Stork. Prek Toal is one of the three core areas on the Tonle Sap Lake, a Biosphere Reserve. Situated in Battambang Province the village of Prek Toal lies at the mouth of the Sangke River. The area consists of seasonally inundated freshwater swamp forest with a high botanical diversity. Short tree shrub makes up most of the landscape, forming a dense under story with scattered large trees, which form the vital nesting ground for large water birds. Prek Toal is unmatched throughout South East Asia for the number and populations of endangered water birds it supports through the dry season. Large flocks of cormorants, storks and pelicans are almost guaranteed from January to May, along with herons, egrets and terns.